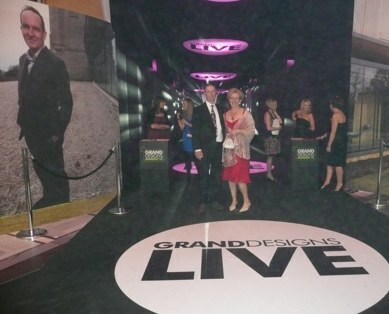 At the Grand Designs Awards in London on May 6th, Old Cragg Hall Barn was named as finalist in the Best Conversion category of the 2010 Awards and appears along with all the other category winners in the July 2010 edition of Grand Designs Magazine. Angela & Steve Marchant (the owners of Old Cragg Hall Barn) attended the award ceremony, along with Lizzie Webster of Fraher Architects and Peter Owen of Cragg Vale who was the main building contractor of the project. The black-tie Award ceremony was hosted by Kevin McCloud from Channel 4’s Grand Designs. Old Cragg Hall Barn has been shortlisted for yet another award. 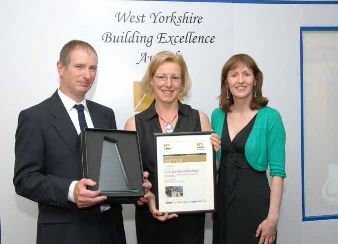 At the RICS Awards 2010 at Elland Road, Leeds, Old Cragg Hall Barn was runner-up in the Tourism & Leisure category. The black-tie Award ceremony was hosted by TV’s Nick Owen. Yorkshire's White Rose Awards are the biggest and most spectacular tourism awards. Old Cragg Hall Barn has been shortlisted for 2 awards in the Welcome to Yorkshire White Rose Awards. One award is for the Best Self-Catering, Cruisers and Serviced Apartments Award, and the second is for the Sustainable Tourism Award. The glittering award ceremony was held at the Yorkshire Event Centre at the Great Yorkshire Showground in Harrogate with judging of the White Rose Awards undertaken by a panel of independent judges chaired by Barbara Woroncow OBE. The RIBA Yorkshire White Rose Awards celebrate design excellence in architecture and the built environment in the Yorkshire region. Old Cragg Hall Barn has been shortlisted for a White Rose Award for Architecture, and also for a Sustainability Award, and has also won a RIBA Interiors Award. Through these annual awards RIBA Yorkshire aims to highlight the excellent work produced by architects, demonstrate the importance of good quality architecture and design, show how good architecture is integral to the economy of the region and to raise the profile of the profession. Old Cragg Hall Barn was shortlisted for the Best Conversion Award at the 2011 Northern Design Awards ceremony at the Manchester Lowry Hotel. Hosted by Local Authority Building Control, the fifth Building Excellence Awards took place on Thursday June 11th, in Bradford at The Holiday Inn, Tong Lane, where West Yorkshire’s most impressive construction developments and projects were honoured for their outstanding quality work and excellence in both design and construction. The lucky winners now go through to the national finals held in London later this year. There were nine different categories ranging from restoration to sustainability and winners were presented with certificates and engraved cut glass crystal trophies. Over 150 guests gathered at The Tong Hotel for these highly prestigious and much anticipated awards, which began with a drinks reception, followed by an impressive three course meal and entertainment for the evening from the incredibly funny, local comedian Mike Kelly. The awards were also followed by a fund raising raffle for the Yorkshire Air Ambulance Charity which raised £1414,50. Nicky de Whytell, West Yorkshire Air Ambulance Development Officer said "The evening has been thoroughly enjoyable and a great success. We would like to thank everyone who attended the awards and for their generosity, the money raised will be a crucial donation and allow Yorkshire Air Ambulance to continue saving lives across the region." The event was sponsored by all local authorities, LABC and Yorkshire Air Ambulance, and Yorkshire Water.